Fairies are short human-like creatures with large transparent wings that they can manifest at will to fly or glide short distances. Temperaments of fairies vary based on the tribe to which they belong. Fairies often excel at manipulating wind, fire, water, or electricity. Goblins are small bipedal creatures with relatively large heads and a knack for trouble. Goblins are not necessarily evil but are often perceived as such because of the mischief they inevitably cause. Viridi resemble tall, skinny humans with dark green skin. They like to make settlements in forests and mostly keep to themselves. They are adept at summoning and magic that involves nature. Zoe'on Kin claim that their age old ancestors were humans that made a pact with a powerful animal-like creature, referred to as a Zoe'on, that they now revere as a deity. They show characteristics of their Zoe'on when in human form (often ears, eyes, and a tail) and can take the shape of their Zoe'on for a limited time. There are several Zoe'on Kin communities each with their own unique characteristics and Zoe'on deity. Renian Zoe'on Kin that are known to travel and excel in Light and Illusion based magics. Their deity, Reyna, is a luminous, fox-like creature with ten tails. 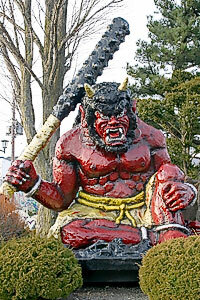 Yutton are similar to Oni in appearance. Constructs that have been imparted the freedom of thought are extremely rare and extremely varied. All however are made from a nillstone alloy and are capable magic users. After a couple dozen years of rearing, a mother dragon will impart knowledge of a humanoid form on her dragonling child and leave them to fend for themselves in a humanoid settlement. Dark red or brown skinned, war loving giants that live in the mountains or in complex cave systems. Yutton are disliked or hated by most other races because of their territorial and often violent tendencies. This page was last modified on 10 January 2013, at 02:47.